Nonwoven paper bag, white, with “Do not eat” printed on it. Size 108 x 74 x 6 mm. Available in quantities of 50 or 500 pcs. Silica Gel Non-food bag, available in 50 or 500 pieces, weight 30 g.
Protect your products from moisture with silica gel desiccant bags. A sachet can absorb up to 30% of its own weight in moisture. Keep the moisture content in your packaging as low as possible and protect your products from moisture and condensation. 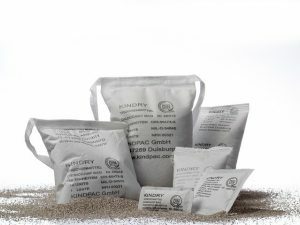 The small bags with water-absorbing silica gel are simply added to the packages such as boxes, cartons, plastic bags and hermetically sealed packages. 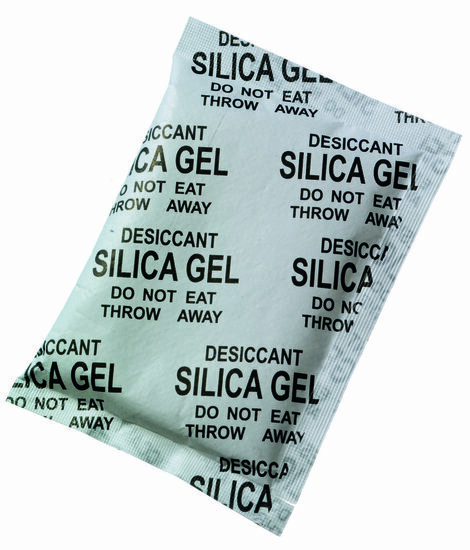 Silica gel bags are also used in the dispatch of electronic devices, components and other goods to protect them against excessive humidity. • Silica gel is not toxic. • Our silica gel is free of DMF (dimethyl fumarate).